• MBBS with Post graduate degree(MS-Obs& Gynac)/ Post graduate diploma(DGO-Obs & Gynec)/ DNB. • MBBS with Post graduate degree(MD-Pedia)/ Post graduate diploma(DCH-Pedia)/ DNB. • MBBS with Post graduate degree(MD-Anae)/ Post graduate diploma(DA-Anae)/ DNB. • MBBS with Post graduate degree(MD-Gen Medicine)/ DNB. • MBBS with Post graduate degree(MD-Psy)/ Post graduate diploma in Mental Health/ DNB. • MBBS with Post graduate degree(MD-Radiodiagnosis)/ Post graduate diploma(DMRD)/ DNB. 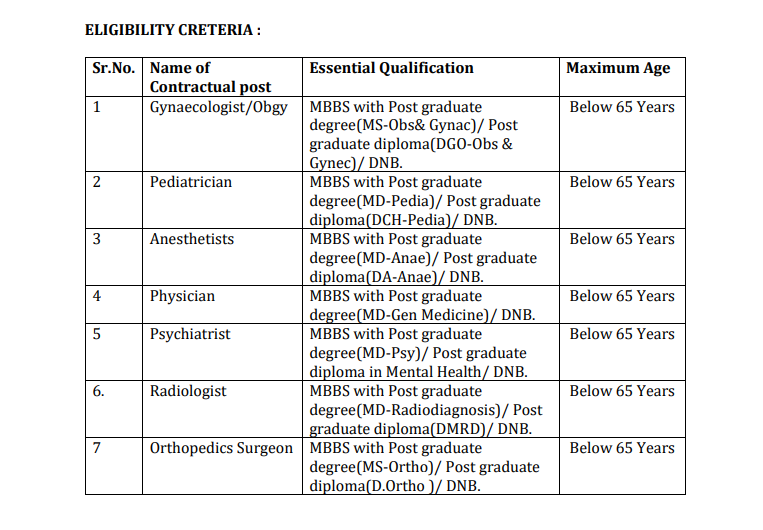 • MBBS with Post graduate degree(MS-Ortho)/ Post graduate diploma(D.Ortho )/ DNB. 5. Those who are already deployed under NHM can apply only for FRU freshly.